Transform your greatest memories into exciting slideshows. 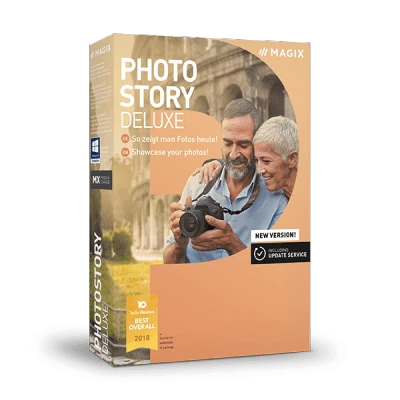 Download MAGIX Photostory Deluxe and design amazing effects, text and music. Create gift ideas for any occasion using the customizable templates for interactive menus. Bring all your most treasured vacation memories and family photos to life – download and test MAGIX Photostory Deluxe for free. Design interactive DVDs and experience your greatest memories on TV or PC time and time again, or export your slideshows to USB flash drives, SD cards, and the Internet. Enjoy the benefits of a clear workflow from slideshow creation to output. Now even faster thanks to new wizards which allow you to import media from cameras, hard drives and data storage devices directly. Impress your audience with unique slideshows and achieve incredible results in record time using one of the many style templates. Download Photostory Deluxe for free and create slideshows almost automatically. Benefit from the program's full Stereo 3D workflow, covering everything from import to presentation. Stereoscopic photos and video clips from any standard 3D camera can be imported, edited in detail, optimized with effects and exported in various ways. Simply download MAGIX Photostory Deluxe and get started.